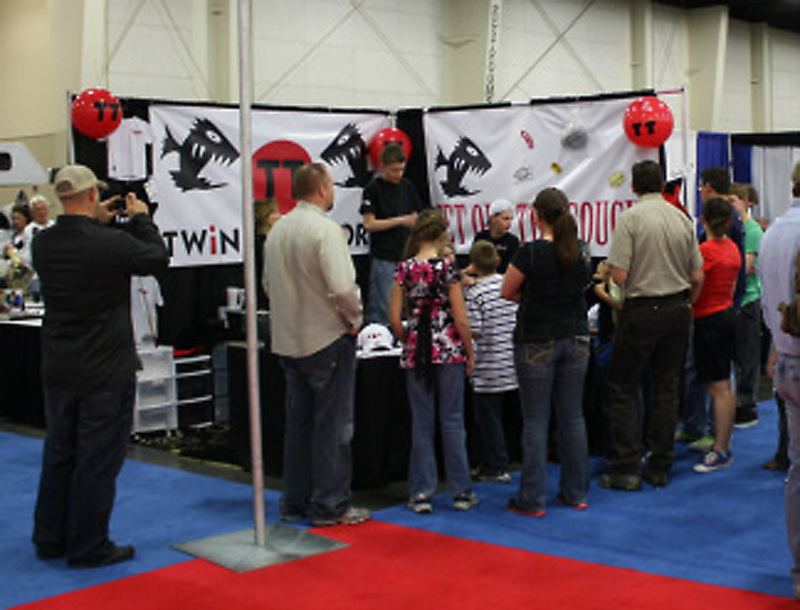 We had the Time of our Life at THE INTERNATIONAL SPORTSMANS EXPO here in Sandy, Utah. So many great people not only let us be a part of the EXPO but helped us in so many ways. We have thanked all of these awesome people personally but not on our Website. Randy, the owner, John Kirk and Jim of the International Expo are such big believers in youth today and getting the kids outdoors. These three facilitate for the Expo to be in several states getting people together that enjoy things like fishing, camping, four-wheeling, hiking, hunting and taking guided tours to great place like Alaska (our dream) : ) and whole lot more. If it weren’t for their efforts, honestly, the industry probably wouldn’t be close to as big as is it today. As much as so many people like to be outdoors . . . there is still room for more! LOL. This is why Randy and John believed in our cause and wanted to help us. They knew we were kids, obviously, and thought, just like us, that we could always use more kids along the river banks, lakes and in the Mountains! Just like the new commercials on TV, our generation loves IPODS, IPADS, LAPTOPS, PS3’s, X Box’s and all of that more and more each day which leaves less and less time for us to be in the OUTDOORS: ). So we , John and Randy want to show ‘our generation’ how much better the REAL LIFE memories are. so other companies that want to help us too! ORVIS, was unbelievable to us, from donating several of the raffle prized to sending one of their Reps, Hutch, who happens to be one of the best people ever to help us out during the 4 days we were there. Many other donations came from Adam Eakle and Tonya Kieffer at KSL, Temple Fork Outfitters, Maniac Custom Lures, Recreational Outlet (Ogden), Hershey’s, Triple S Polaris, Kent Shooters, The Rocky Mountain Elk Foundation, Ivory Homes and more friends and family. They were awesome to say the least. Anyone who reads this post needs to make sure they go the the Expo next year, especially if you have never been. They love your kids and love the outdoors. . what is better than that???? Twin Territory is all about getting into the OUTDOORS. We won't deny it, we like video games. . . but we love being outside, in nature, I guess you could say. This is where real life is and memories are made. We want to get all of our friends out there off of the couch and having real life fun outside in our territory.